The most groovy drum app for iOS! 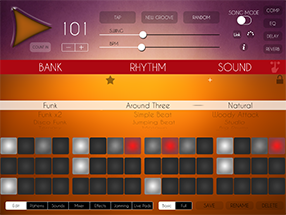 The new Funk Drummer is full of rhythms and sounds with the essence of authentic Funk, from classic R&B to fusion. The best sound with the best improvisation tool boosted with amazing effects and the fastest song mode. 35 multilayer sounds with 3 different hits (ghost note, accented note and special) x 3 RoundRobin alternating samples. The Round Robin alternating samples combines 3 layer samples of each stroke to create a extremely natural sound. Funk Drummer is more than a drum machine. The jamming tool improvise like a human drummer creating musical rhythmic variations and breaks. Just move a slider to set the level and play music.